The craft derives its name from its makers, the Usta, a community of craftsmen who migrated from Multan in Pakistan to the mughal court at Delhi and later, on being invited by Raja Rai singh, to Bikaner. Gesso painting is also known as Nakashi art at its origination place. 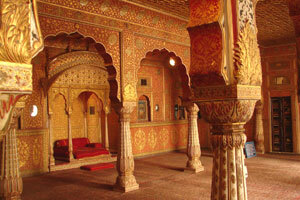 The technique was used to ornament the walls, pillars and ceilings of Bikaner’s Junagadh Fort and Anup Mahal with resplendent golden motifs of delicate floral and animal forms, often set against detailing in radiant colours. During the time of British in India, Nakashi work on camel leather became popular. Camel hide was light and unbreakable, and saddles and bags that were commonly used for transporting water became common bases for Nakashi work in this desert kingdom and adjoining areas. Leather work is an old craft in India that began as a cottage industry, and continues, in large parts, as such. Leather work as a cottage industry functioned with different groups performing different roles in the preparation of the leather, and in crafting products from leather. The fact that India has a very large livestock population has contributed in no mean way to the prolific output and continuity of this craft. The craft process begins with the making of a clay mould on which a piece of previously cleaned and softened camel hide is stretched. The piece is dried in the sun for a maximum of 48hours before the mould is removed. Then begins the akbara, or design making process, wherein the pattern is embossed onto surface using a paste of powdered bricks mixed with jiggery and fenugreek seed powder. The coloured are first painted in, followed by gold detailing and thin black outlines that serve to define the motifs and background. Finally, the ground colour, usually red and green, is applied and the entire surface is coated with traditionally prepared varnish called chandras. The most popular gesso compositions at Bikaner is the taarabandi , a star studded sky and naqqashi, a pattern of minute flowers and motifs.